Lovely work! 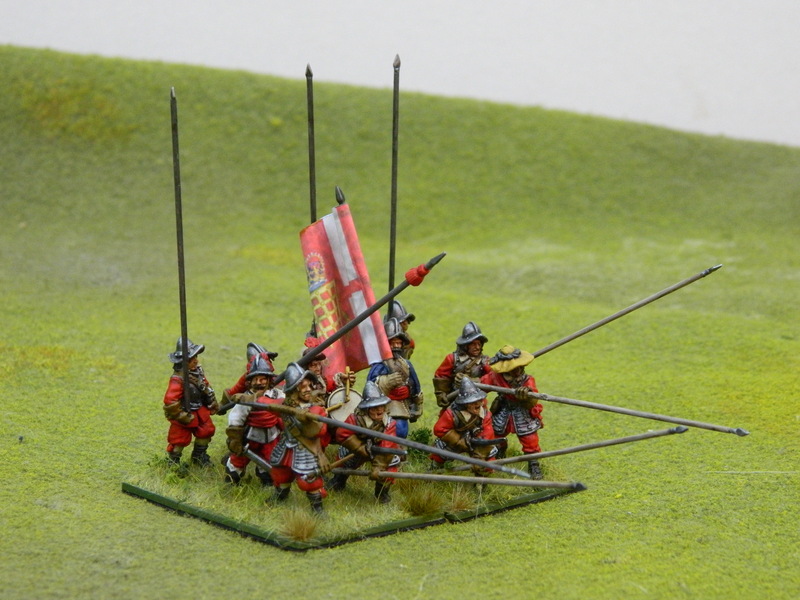 I use lots of Wargames Designs' flags with my 10mm figures, which have a nicely faded look. Pity that most flag producers don't tend to represent the nails which attach these beauties to the staff. I especially like the dynamic effect you have got from the mixture of poses. They are nice, agree with the comment about posing of figures. Very nice work. God save the King! Very nice! I can just hear about hear that officer figure yelling "CHARGE YOUR PIKE FOR HORSE AND DRAW YOUR SWORD!!!" wow ! really nice . how do you transport them ? that's always seemed a problem with pike units ! ernieR, my EC W stuff has only ever left my place a few times over the last few years but when I take them anywhere I out them in 9L (I think…) RUB boxes. Now just come to southern Ontario and we can have a nice game. I also heartily recommend Really Useful Box 9 litres for pikemen. Also good for cavalry with lances or cornets. They do them in different colours so you can colour code your armies if you are really obsessive (which I am!). Maybe one day… I was born in St. Catharines and still have family there. They do them in different colours so you can colour code your armies if you are really obsessive (which I am!). Really? I have only ever seen them in blue at the local Staples. Hi Codsticker, yes, there is a rainbow of colours produced, but availability varies. I have taken to ordering directly from RUB, but even this very week they are out of red 9Ls for my new Imperial troops. I see they have a USA distributor which may be better for you than Europe.